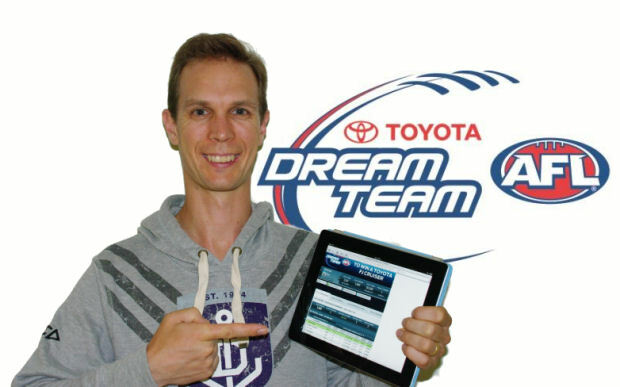 We all dream of winning AFL Dream Team… but think we would never have the chance. Dave Baker from WA felt the same way but he ended up walking away with the major prize in 2012. He shares his story with us. I always assumed that a person who actually won Dream Team overall was like a full-time stock market trader: a person who spent all day studying dream team statistics and obtaining inside knowledge from AFL’s inner sanctum, unburdened with the distractions of kids, a full-time job or a university course they felt any particular need to pass. To come first out of a few hundred thousand people it seemed obvious that they must have come up with some inspired team to begin with, containing some off-the-radar uniques that few would have had the insight or guts to pick. At very least, they would have to have a team where it all went right all season, with very little in the way of FMDT moments, such as players getting injured the first round you traded them in. Actually, it was my fourth year of dream team, having held off for a few years while I had newborns kicking around the house, correctly fearing that Dream Team sounded like the kind of thing I could get addicted too. I’d managed to win both my leagues in my first season so I’d obviously had a bit of a knack but I’d never been a serious contender for overall glory. On the home front, a crucial development at the start of the year was that we deemed that my son (who also shares my love of sport and mathematics) now sufficiently understood the difference between real football and fantasy football to be allowed to coach his own dream team. This was crucial because it meant that what was previously an indulgent pastime now qualified as quality family time. It was a tenuous link but I ran with it, throwing misgivings about taking fantasy football too seriously aside and splashing out on Assistant Coach, the DT Talk Cheat Sheet, etc. Strategically, the key insight I had(and obviously wasn’t alone with this) was that with that with all of the expansion club rookies guaranteed games and 24 trades to play with, there was no reason (injury carnage aside) that by the end of the season you couldn’t have a team containing only the best players in each position. I’d managed to briefly crack the top 100 for a couple of weeks the previous year so I had one eye on the overall prize but with league wins my main focus I thought that I’d happily forego any sideways trades during the bye rounds so I could use the four extra trades to do a couple of extra upgrades and peak at the right time of the season.With the magic number set to take a hammering in the first half of the season while all of the GWS rookies climbed in price, I avoided mid-pricers (bar a defender or two due to the lack of quality rookies or genuine premiums) figuring that they would make negligible growth and need to be upgraded anyway to achieve my all-premium goal. So G’n’R it was, particularly in the midfield where I started with Swan, Ablett, Boyd and a good value Jobe Watson. The forward line was more full of prospective premiums, some of whom worked out (Dangerfield, Sidebottom), and some of whom, well, are still affordably-priced this year (Fyfe, Martin). GWS rookies filled out my benches and remaining field positions and proved crucial in making the serious cash and bench cover that kept me rising over year. However, in the long term this proved to be a good call and Skinny Boys ascent up the ladder soon began. By the end of the bye rounds (during which I did cop a league loss but kept building overall) the Skinny Boys had cracked the top 50. During one of my many scrolls through the top 50 rankings (I was cautiously excited about reaching these unfamiliar heights), I noticed that although my team was just scrapping into the top 50, my team value was higher thananyone else above me. I didn’t know exactly what this meant but thought it had to be a good thing, possibly reflecting that I’d been going more for long-term value/growth more than the other teams who were near the top of the ladder midway through the season. At this point, phrases like “make sure you leave enough time to check your Dream Team” and “kids don’t bother Dad he needs to check the teams” suddenly started to emanate from Mrs Skinny’s mouth for the first time, or at least the first time without being laced with sarcasm. She even vowed that if I won us the car then she would never ever complain about me watching/listening/reading/obsessively-checking-football-related numbers again, further upping the stakes. By the last week of the season, the Skinny Boys had hit the front and I agonized over my last two trades more than any in my life, endlessly analysing the teams immediately behind me and how I could maximise my chances of holding on to my slender lead. By the Sunday night though, the frayed nerves in the Skinny household turned to partying as we celebrated winning a new car and I braced for achieving fame amongst a very small (but discerning) section of the population.The celebrations continued with a long-planned boys trip to Melbourne, where I got to see the Dockers win a final at the MCG, something which had generally seemed about as likely as me winning dream team. It was a good week. Big shout out to my league mates for the last 4 years, especially the organisers of my two leagues, Jeremy T (because he kept asking me to join dream team for years despite my repeated negative responses) and Chris M (because the modest, self-effacing lad asked to be mentioned in the article). I love how the wife turned supporter mid way through the year! Congrats bro, thanks for the read. BTW I completely agree with your ideas onto having any or many serious uniques and being able to swing into contention for overall prize from some low positions at the halfway point of the season. I finished 8th overall last year through much the same kind of thinking as you. Cheers mate. It’s good to know how GK’s gonna feel after season 2013. Well that was an eloquently written pleasure to read. I too have a better half that has come over to the dark side of the DT force in recent times. Perhaps a turning of the tide is at hand? Could we possibly see a new reality show called Fantasy Footballer’s Wives just around the bend? Great Article, I just hope I can also get in a position that will get my wife to support my DT addiction instead of giving me the guilt treatment when I spend time on it. Nothing a new car can’t fix poissonsale…. Unfortunately I am in the camp of having an anti-DT wife and I can’t see her turning at all (I got as high as 15 last year and it barely raised an eyebrow). My son is 4 so I’ll have to work on him over the next few years. I really appreciate you telling your story – thanks for sharing. What colour was the FJ? hahaha is that you Dale Kerrigan? Love the article, always something to learn from experienced DTers. Great read mate. Brings back memories of when I first started playing in my dad’s league at 14. Now I’m 19, and beating him across several fantasy sports. Well deserved win. Congrats Dave for a great 2012 DT season and being (more than likely) the last winner of a car prize in DT! I expect you are a one-eyed, long-suffering Freo fan…like all Freo fans! How many Dockers players did you have in your team? Well done fella. Good to know that i can start with Broughton, trade him out and still have a chance to win the whole thing! Congrats on the win and a top read! Congratulations on the win mate, great effort. I finished 22nd last year, but was as high as 3rd after Rounds 17-18. It seems you managed to hold on to your trades better than I did which is all credit to you. I’d be interested in what your scores were across the 3 bye rounds as I feel that was the best place to make up ground last year. Actually I think I was 45th before the bye rounds and 37th afterwards so I actually only came out marginally ahead (but at one point during the bye rounds I was back in the 100s so it was very up and down). Congrats mate. And thanks for the read. Any chance you could let us know your starting structure from last year? Actually I’m not too worried about giving away secrets from last year because this year will be so different. Forward line was 5 premiums/prospective premiums, a bargain mid-pricer (Porps) and 3 rookies. Rucks were 1 premium and 3 rookies, midfield was 4 premiums and 4 rookies while defenders were 4 premiums, 2 mid-pricers and 3 rookies. Well written and congratulations. No boasting or big-noting, just a good summary of a game well played. Average was 2185. Yeah, once it clicks over into the new season all records seem to be lost. if you have last years app then everything is still available to check out. Top job mate! I won S***r C***h last year and I’ve struggled to put a couple paragraphs together when trying to explain my season. Was great hearing about how it all panned out for ya! Thanks all for the kind words. Now time for me to get my head down and focus on the new season! if anyone is interested in joining a $30 dt league join 362238. will be providing bank details in the chat box. at end of season if you are a prize winner you can put your bank details in the chat box and i will transfer you your winnings. league half full already but struggling for numbers. if you join you have must pay entry immediately otherwise you will be booted from league prior to season start. 1st prize in grand final will get $270. 2nd will get $160. 3rd (winner of 3rd v 4th in grand final week) will get $80. Winner of bottom 8 grand final will get money back of $30. hey hey, saw the photo at the top and thought….I recognise that face. I played tennis with Dave once upon a time at Manning. Nice Work Dave! Hey Skinny Dave well done mate, just wondering if you remember what cash you had left when you first picked your team? i was wondering the exact same thing. I think that is more important to team value than any picks.